EURUSD: Waiting for the Euro to Give In..
Last week we expected the euro to start falling again, which was exactly what happened. Price came crashing through our confirmation point, and then continued downwards to come 33 pips short of reaching our first target. This price drop occurred in 5 waves, which strongly confirms our view that the downtrend is back in play. But as we know by now, every completed 5-wave sequence needs to be countered by a corrective move in the opposite direction, which is what we expect to see during this week. The bigger picture sees that the euro is moving towards the downside in cycle wave x, which is forming a double zigzag labeled primary waves W, X and Y. Primary wave Y is forming a zigzag labeled intermediate waves (A), (B) and (C). Intermediate wave (A) formed an impulse labeled minor waves 1 through 5. Within it, minor wave 3 reached 261.8% the length of minor wave 1. Minor wave 5 extended as an impulse labeled minute waves i through v, reaching 161.8% the length of both minor waves 1 and 3. Intermediate wave (B) formed a double zigzag labeled minor waves W, X and Y, retracing a little less than 38.2% of intermediate wave (A). Intermediate wave (C) is most likely forming an impulse labeled minor waves 1 through 5. Within it, minor wave 1 is complete. Minor wave 2 retraced just over 61.8% of minor wave 1, and it’s most likely complete. 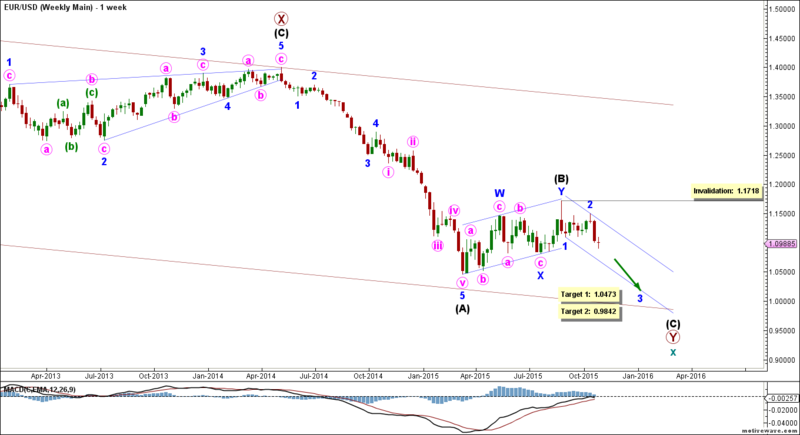 This count expects the euro to be moving towards the downside in minor waves 3. This will be confirmed by movement below 1.1087. At 1.0473 minor wave 3 would reach 161.8% the length of minor wave 1, then at 0.9842 it would reach 261.8% of its length. This wave count is invalidated by movement above 1.1718 as minor wave 2 may not move beyond the start of minor wave 1. The main count sees that minor wave 2 formed a double combination labeled minute waves w, x and y, each forming a zigzag labeled minuette waves (a), (b) and (c). Minor wave 3 is forming an impulse labeled minute waves i through v.
Within it, minute wave i formed an impulse labeled minuette waves (i) through (v), and it’s most likely complete. 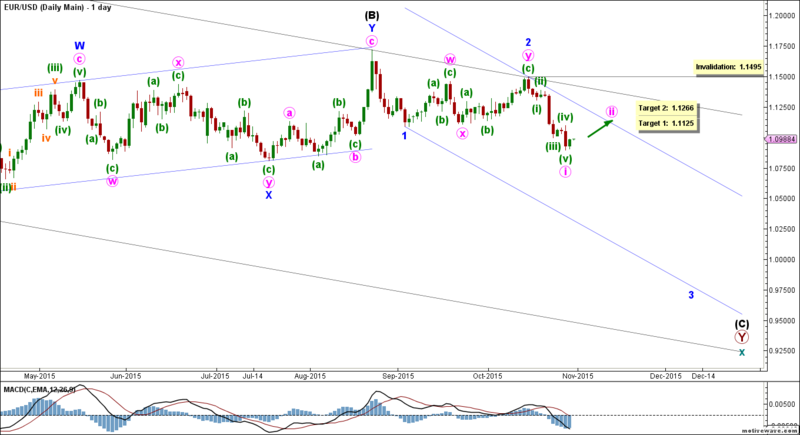 This count expects the euro to start moving towards the upside in minute wave ii. This will be confirmed by movement above 1.1096. At 1.1125 minute wave ii would retrace 38.2% of minute wave i, then at 1.1266 it would retrace 61.8% of its length. This wave count is invalidated by movement above 1.1495 as minute wave ii may not move beyond the start of minute wave i.
GBPUSD: Strapping Seat Belts !! Continuing with the metaphor I have been using lately regarding the bearish train and I admit I have been abusing that metaphor and I will try to stop using it -tongue in cheek-. We continue this week expecting that the bearish train is about to gain momentum. It is worth noting that Cable unfolded downwards as the alternate count expected and that both targets were reached and exceeded. This week`s main count expects Cable to immediately free fall within an impulse as the main count expects that Cable is forming a series of first and second waves. The alternate count expects Cable to unfold upwards to complete a second wave correction. As always we will wait for either counts confirmation point to be reached to determine the highly probable count. Elliott Wave chart analysis for the GBPUSD for 26th October, 2015. Please click on the charts below to enlarge. Wave (y) green unfolded as a zigzag labeled waves a, b and c orange. Wave c orange unfolded as an impulse labeled waves 1 through 5 purple with wave 1 purple unfolding as a leading diagonal labeled waves (1) through (5) aqua. This count expects that wave iii pink is underway with waves (i) and (ii) green complete and wave (iii) green is underway. Wave (ii) green unfolded as unfolding as a zigzag labeled waves a, b and c orange. Within wave iii orange it is likely that waves 1 and 2 purple are complete and that wave 3 purple is starting to extend downwards. Within wave 3 purple it is expected that waves (1) and (2) aqua are complete and wave (3) aqua is underway with waves 1 and 2 red complete and wave 3 red is unfolding downwards. This count would be confirmed by movement below 1.5305. At 1.5281 wave (3) aqua would reach equality with wave (1) aqua. At 1.5269 wave 3 red would reach equality with wave 1 red and the final target is at 1.5195 wave (3) aqua would reach 1.618 of wave (1) aqua. This count would be invalidated by movement above 1.5420 as wave 2 red may not retrace more than 100 % of wave 1 red and it should be noted that the invalidation point would be moved to the end of wave 2 red once we have confirmation on the hourly chart that wave 3 red is underway. N.B. : This count is presented on a daily chart for clarification purposes. This count has lower probabilities and the alternate count presented on today`s analysis here has higher probabilities as this count does not provide the best fit and it ignores important Elliott wave guidelines. We decide to mention this count since many of our members requested an analysis of this count. This count expects that wave (3) black has started unfolding downwards and within it, wave 1 blue is complete and wave 2 blue is unfolding towards the upside. Wave 1 blue unfolded as an expanding leading diagonal labeled waves i through v pink. Wave iv pink unfolded as a zigzag labeled waves (a), (b) and (c) green. Within wave 2 blue, this count expects that waves a and b pink are complete and that wave c pink is unfolding towards the upside. The problem with this count is within the structure of wave 1 blue as this count suggests a leading diagonal. Since wave iii pink is longer than wave i pink, then this structure is expected to be an expanding leading diagonal. So what do we know about expanding leading diagonal besides being a very rare formation ? 1- In expanding leading diagonals, wave four is expected to be longer than wave two. 2- Wave one is expected to be shorter than wave three. Wave three is expected to be shorter than wave five. 3- The line connecting waves one and three and the line connecting waves two and four should be diverging instead of the convergence we typically see in contracting leading diagonals. This expanding leading diagonal only fulfills the first point and neglects the second and third points, therefore this count has lower probabilities. This count would be confirmed by movement above 1.5510. At 1.5555 wave c pink would reach 0.618 of wave a pink and at 1.5619 wave 2 blue would reach 0.618 of wave 1 blue. This count would be invalidated by movement above 1.5932 as wave 2 blue may not retrace more than 100 % of wave 1 blue and as well this count would be invalidated by movement below 1.5107 as wave b pink may not retrace more than 100 % of wave a pink and it should be noted that the invalidation point would be moved to the end of wave b pink once we have confirmation on the daily chart that wave c pink is underway.